I am not a big fan of tofu, although I tried many times to actually like it. It's the texture that I find too wobbly when the tofu is cubed. That combined with its tastelessness or sometimes soapy taste made me give up on tofu. Alright, now I am sitting here trying to sell you a tofu-filling for Jiao Zi (Chinese dumplings). I don't know what struck me when I searched for vegetarian fillings for Chinese dumplings, that made me go for a tofu based one. Never mind, it was a good decision. And I think I learned something about tofu. Probably nothing train-smashing new, but it was eye-opening for me: tofu adopts the flavors of the rest of the dish. As long as a dish has strong-flavored ingredients, tofu will play along and act as a healthy filler. This vegetarian filling was inspired by a recipe that I found here. 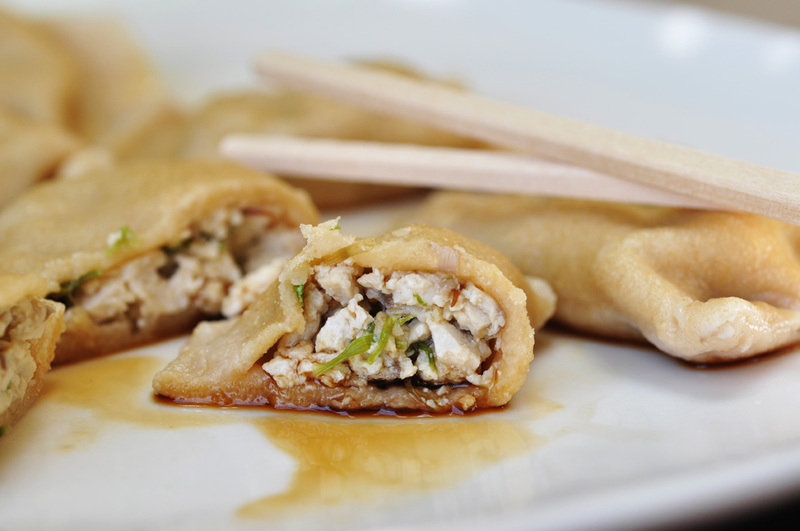 The strong-flavored ingredients in this filling are mushrooms, chives, soy sauce and rice wine. The original recipe asked for dried mushrooms and Chinese chives. Dried mushrooms I couldn't find and I wasn't quite sure what Chinese chives are, so I went for regular ones. It's a great combination, and whenever I feel like Chinese dumplings, I will dish up these vegetarian ones too, next to my pork-filled Jiao Zi. In a large bowl, thoroughly mix all the filling ingredients together. Place a teaspoon of filling onto the center. Don't use too much filling as the wrapper will tear. Fold the wrapper in half and press together to form a half moon shape. Seal tight so that there are no gaps. Keep the dumplings covered with a damp towel if you don't cook them immediately. Fill a large pot with water and bring to boil. Add the dumplings (depending on the size of the pot not more than 10-15 at a time). Stir to prevent the dumplings from sticking together. Bring back to boil, then add 1/2 cup of cold water. Cover and repeat another two times. When dumplings boil for third time, they are ready. Drain and serve immediately with soy sauce. Any leftover dumplings can be pan-fried the next day, and are as delicious!!! !